The first time I was told that I needed to go on a diet was at the age of seven. My family was sitting down at the dinner table when my father turned to me and said “Girl, you need to go on a diet.” As I dropped my head in shame, I visualized what a diet would entail. I would be locked away in our small town jail and be fed bread and water until I became slim and trim. Of course, I was never locked away, but my father’s cruel words and ridicule were ever-present in the back of my mind. The fat jokes and comments came from others as well, so I hid behind my strong, tough, tomboy self-defense mechanism. Only God and my horse knew the truth as I shed tears in the dark corner of our barn. As a college freshman, I chose a career in law enforcement. I had to start exercising a little and lose enough weight to be hired by the California Highway Patrol, and I finally made it. I was so out of shape when I reported to the academy. After I endured five grueling months of boot camp, I graduated in the best shape of my life! However, this was not going to last for long. In the next five years my life did a complete turnaround. My career ended after three car accidents, a pursuit, a shooting, a fight and two back surgeries. In the midst of all of this, I met my wonderful husband, became “Mom” to his spry son and lovely daughter and gave birth to my two beautiful girls. I dearly loved my family, but I was fat, miserable and depressed. Over the next 20 years, I tried numerous weight loss programs, but I kept losing and gaining the same 20 pounds. 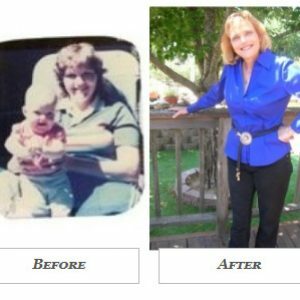 Health issues, along with chronic back pain, slowed my progress. In 2007, the Lord led me in the direction He wanted me to follow. I was in a Christian bookstore and just happened to come across a First Place 4 Health Bible Study and Carole Lewis’ book Divine Diet. From the moment I began reading and studying, I knew this was what I needed. I did the study by myself for several years, and then in 2010, a girlfriend of mine from church prompted me to start a FP4H group. God made it very clear that this was His desire. I enjoy leading my group and encouraging the members to live a balanced life by putting Christ First. My walk with the Lord through FP4H has healed many of my wounds as well, and has made my family and I so much healthier. I should have known, however, that God wasn’t through with me yet. In spring 2010, I was asked by Vicki Heath if I would consider becoming a networking leader for California. I told her I didn’t feel I was qualified for that important position, but I would speak with my family and we would pray about it. My church group was also praying and encouraging me. The Leader’s Summit was in July, so I told her we could talk again then. Upon arrival, I was still uncertain what I should do, but God knew! He had people set in appointed locations throughout the weekend to pray for me, encourage and direct me. As soon as I returned home, I applied for the position. In October 2014, 30 years after my last day with the CHP, I reached two milestones. I was selected to become the networking leader for California, and I achieved my goal weight—having lost 36 pounds. I thank the Lord every day for this new opportunity to serve Him. He has also given me a sisterhood of FP4H friends who continually pray for me as the Holy Spirit knocks down my wall of toughness and I learn to live for Him. Come hear more from Jeanne at Summit 2015 in Houston on July 24-25.